A new park will hold its ribbon cutting on Monday, May 14th at 10:00 AM. At that time, the Delaware River City Corporation (DRCC) will christen the new 4.5-acre Lardner's Point Park located at Levick Street and the Delaware River. Lardner's Point park sits at the foot of the Tacony-Palmyra Bridge and will serve as a major trailhead for the not-yet-completed North Delaware Greenway trail. The trail will eventually travel along or near the Delaware River Waterfront from Allegheny Avenue to the Philadelphia-Bensalem border at Poquessing Creek, and serve as a designated part of the East Coast Greenway. The Park was carved out of vacant land adjacent to the historic Lardner's Point pump station. Looking out on the river one can see the bascule bridge which opens occasionally for large ships (including this hopper dredge). 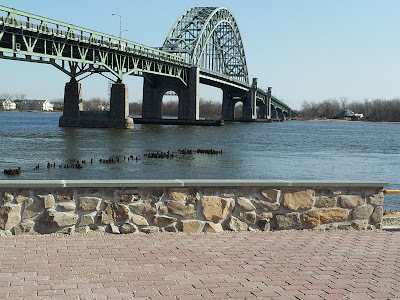 Directly across the river in New Jersey lies Palmyra Cove Nature Center which you can visit by using the Tacony Palmyra Bridge sidewalk (walk your bike). Support the DRCC's efforts by attending their annual Spring Fling on May 17th from 5:00 to 7:30 PM at the Delaware River Yacht Club, 9636 Milnor Street in Philadelphia. Beer, wine and light refreshments will be served. For more information contact DRCC at 215-537-8400 x135/136 or by e-mail to info@drcc-phila.org.